Simpler times will come back to life with the Colfax Love Seat Glider. Sit and swing, enjoying your favorite beverage with your friends, family or neighbors in this retro style glider. Aluminum construction means that this glider will be with you for quite a while. Because we offer a variety of powder coated finishes on this piece, you can be sure that your style will be matched perfectly. 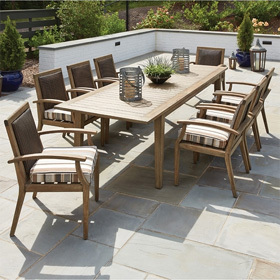 Enjoy this glider either with a friend or all alone, secure in the knowledge that this perfect piece has rounded out your patio with flare and style.